This entry was posted on September 5, 2014 by Badsero. Radiant floor heating is a popular method for heating living and commercial spaces. It is commonly used in new construction as an alternative to forced-air systems, or in conjunction with them for certain rooms, especially bathrooms. Outdoors, it is used in slab to melt snow on driveways, walkways and in porches and patios. Today we’re going to be talking about electric in floor heating and discuss the advantages, disadvantages and installation concerns for each of the types. If you haven’t poured the slab yet, this is the best system. The wire is placed within the concrete slab and the entire slab absorbs the heat and radiates it to the above floor. 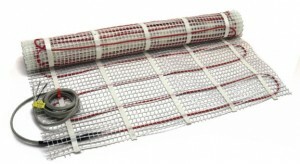 The simplest way to install electric floor heat is the pre-made electric mat. The electric mat is a plastic lattice, similar to plastic fence material, with the heating wire woven into it. These are stapled to sub-floor, then you mortar over it, allow the mortar to cure, then apply thinset and tile over it. They are simple, quick to install and, and perform well. Mats are available in many sizes, and voltages, but they are all sold in square and rectangular shapes, so if your room is irregular or uniquely shaped, there will be cold spots or there may be no way for a mat to fit at all. Some people choose to not float the floor and install the tile directly over the mats. I find setting directly over wire or mat that has not had leveling cement installed over it to be very challenging. It’s much harder to lay the tile flat and without causing lippage. 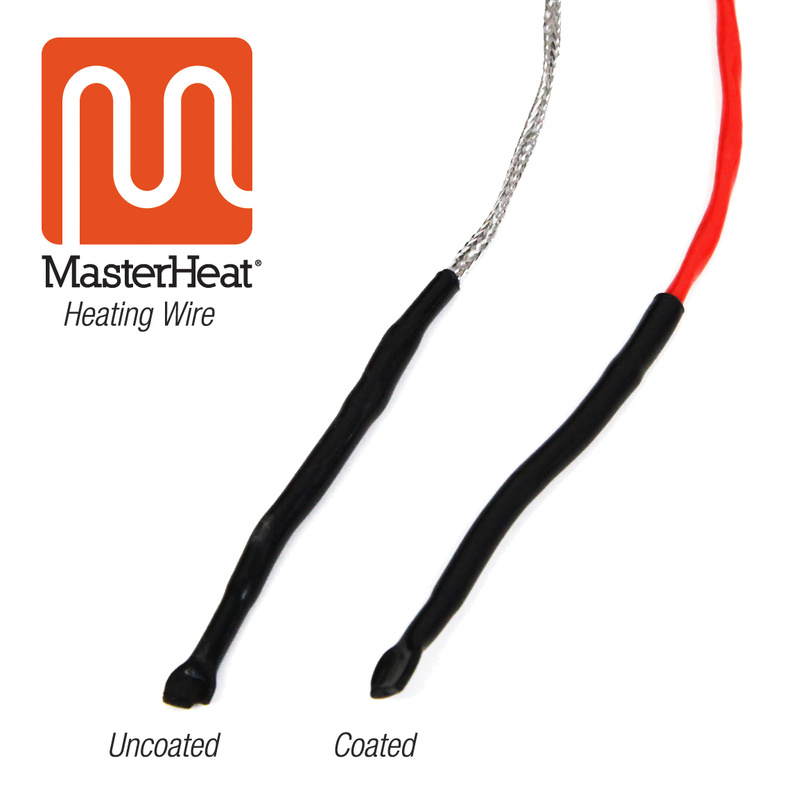 Wire installed with gauging strips and pre-made mats do not offer any protection to wire. Custom mats are a great way to get the advantages of mats without the concern of having dead spots in your floor. Custom mats can be tailored to fit most size rooms, and have all the advantages of pre-made mats. The primary concern with custom mats is that they cannot be returned and must be ordered with plenty of lead time. For pro's or DIY, this is probably the best overall combination and my personal favorite. The mat and wire can fit any size and shaped room leaving no dead spots. The RPM mat is used in place of backer board so your gain in height is limited. The RPM has a matrix of evenly spaced knobs that hold and protect the wire. 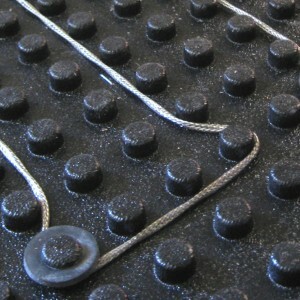 Small rubber donuts secure the wire to the mat. RPM mats installation of wire, and they accommodate 2”, 2.5” and 3” spacing. They allow the floor to be floated flat very easily as the knobs act as a screed for your mortar (we recommend our fast-setting MasterHeat Mix with RPM mats). If the tile needs to be replaced later, the RPM mats protect the wire making it less likely the heating system will be damaged during removal of a tile for repair or complete removal of tile. 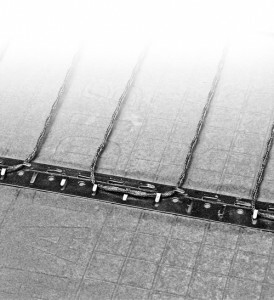 The traditional way of installing in floor wire is to use gauging strips. These metal strips are placed along the perimeter and the wire is looped around them at the required spacing. They are simple and affordable, but the wire is much less protected than with RPM mats so care must be made by those installing the heating system and tile not to damage the wire. Uncoated wire installed with gauging strips is very cost-effective if you can ensure the wire will not be damaged by whoever installs the flooring. Coated wire is more expensive, and can be installed in showers. That covers the basic choices for electric in floor heating. In our next post, we’ll discuss the various ways to install these products in more detail.